Augustus S. Merrimon, a Chief Justice for the North Carolina Supreme Court, built The Merrimon-Wynne House in 1876 to serve as his private residence. It was the centerpiece of a park-like setting at its original location on N. Wilmington Street. In 1899, the Merrimon estate sold the home to A.F. and Lula B. Page. Shortly after purchasing the home, Lula’s husband passed, and she married J.S. Wynne of Raleigh. Twenty years later, in 1919, the Wynnes deeded the house to Peace College, and thereafter it became known as “Wynne Hall.” It served its first stint as a dormitory from then until 1934. From 1935 to 1965, the mansion served as the residence of Peace College president W.C. Pressly. After his retirement in 1965, Wynne Hall was reverted back to dormitories. With the development of the Halifax Government Mall in the early 1970s, the state acquired the house and converted it to office space, and it was used as such for the next 32 years. 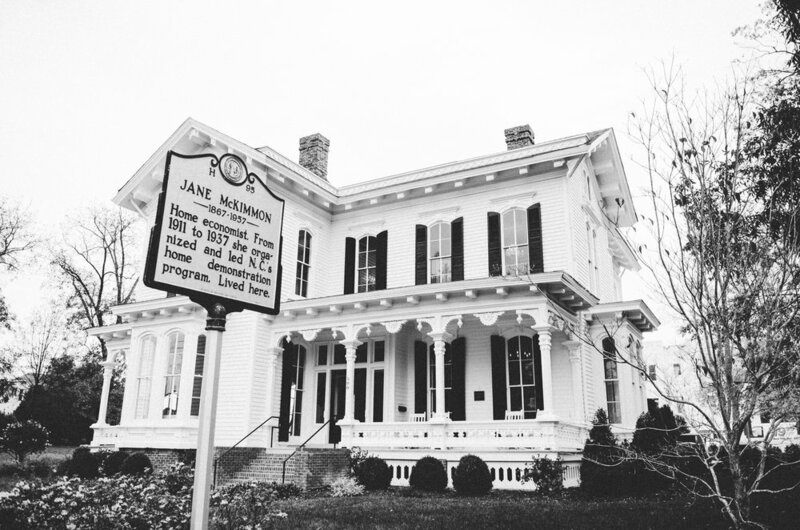 In 2008, the developers of Blount Street Commons purchased the home and moved it to its current site at the corner of Blount and Polk streets—the birthplace of Dr. Jane McKimmon. McKimmon served as a leader in home demonstration work for 35 years and received many honors for her work in youth and adult extension education in North Carolina. After being safely anchored on its new site, The Merrimon-Wynne House was purchased by Heyens Holdings in 2013 and has since been restored to its original grandeur. The home now serves as the premier wedding and corporate events location in Downtown Raleigh. Credit and thanks to Karl Larson and goodnightraleigh.com for their contributions.